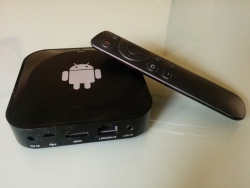 This HTPC uses a pretty common case design, and sometimes can be found as the Q5 or I12_TvBox or unbranded. But whereas the Q5 or I12_TvBox use a Ampak AP6210 Wifi/BT module, the QT840 uses the Ampak AP6330. For building u-boot, use the "qt840a" target. Use the sun7i-a20-i12-tvbox.dts device-tree file for the mainline kernel. The push button on the rearside of the board triggers FEL mode. Only clips attach the top of the case to the rest of it. Insert your plastic tool along the top edge, and gently push the outside rim outwards, the clips should soon release. There are some clearly visible test pads next to the SoC. All you need to do is attach some wires according to our UART howto. This page was last modified on 12 April 2015, at 10:29.